Upon opening the box, I was a bit miffed that crammed in the box was junk mail (that I specifically talked about not getting but who knows, could have been someone new) and amongst the junk were four shiney post cards! Well, three were shiney – one was in an envelope with a canned apology about the damage (looks like it got dropped in water and the ink ran a bit – but the post card DID say that it was raining and they were expecting a tropical storm.. so…) but the card was legible and in pretty good shape. The larger post card from China had a few dings in it. 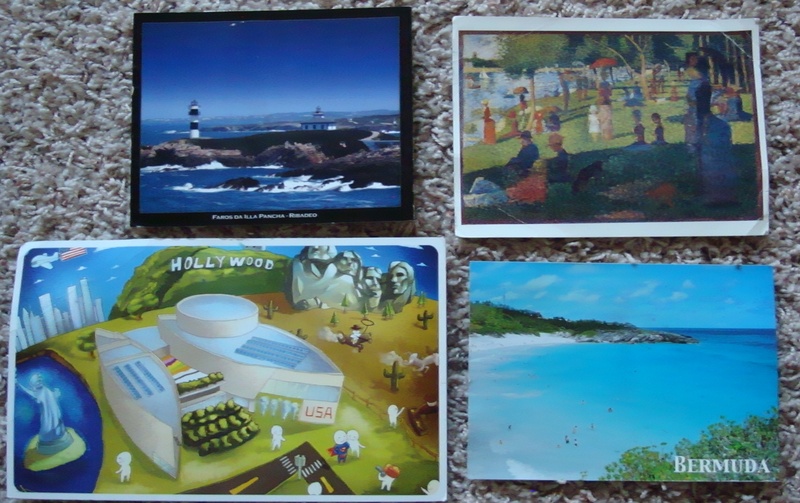 The are from (from top left going clockwise) Spain, USA, Bermuda (the one with the water smudges) and China. Now I need to figure out a way to store these lovely treasures because I know when my mom and dad come to visit, they’ll like to look them over. They like looking at the envelopes for the mail art and the stamps – especially the stamps. I hope you had a good mail day as well!